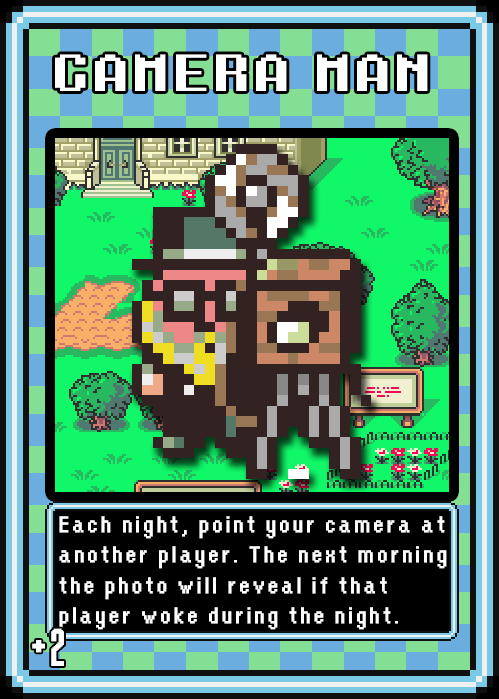 Camp Fangamer 2015/07/18 7:00 PM ??? 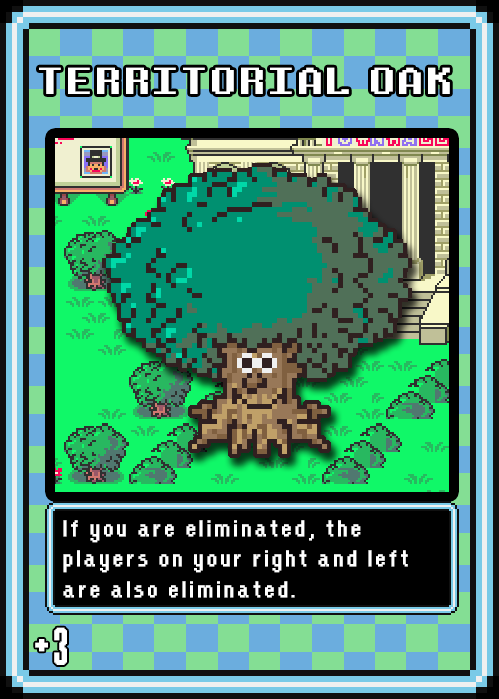 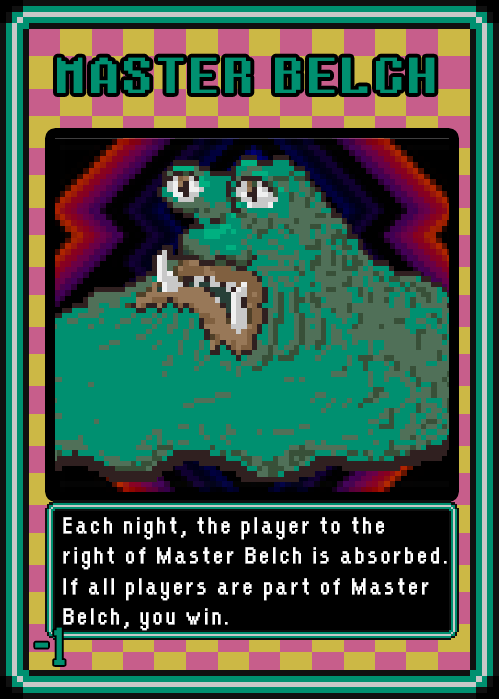 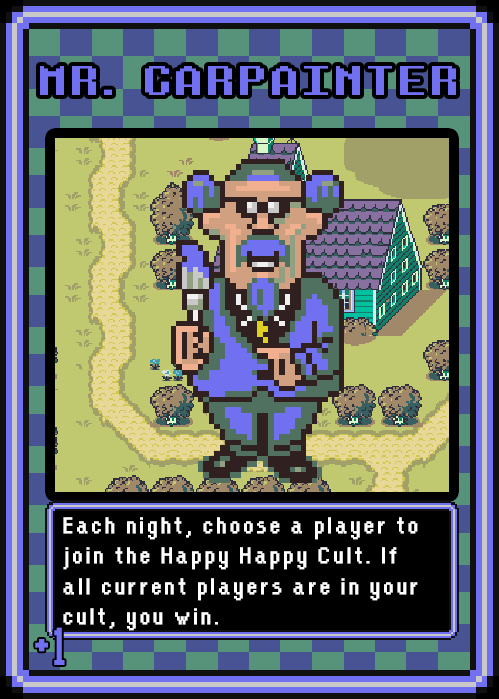 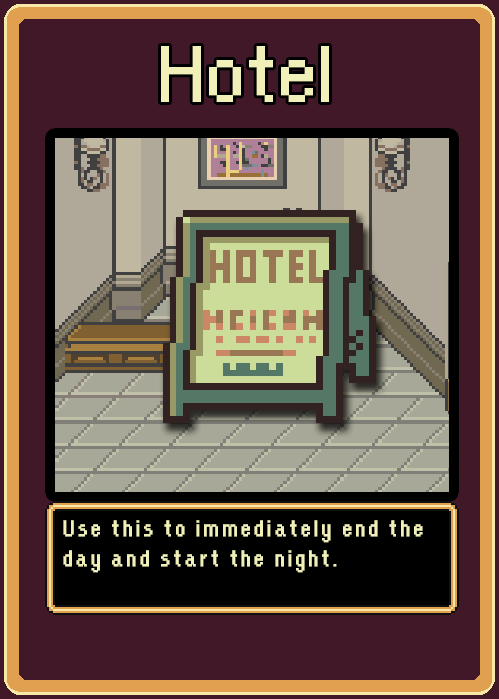 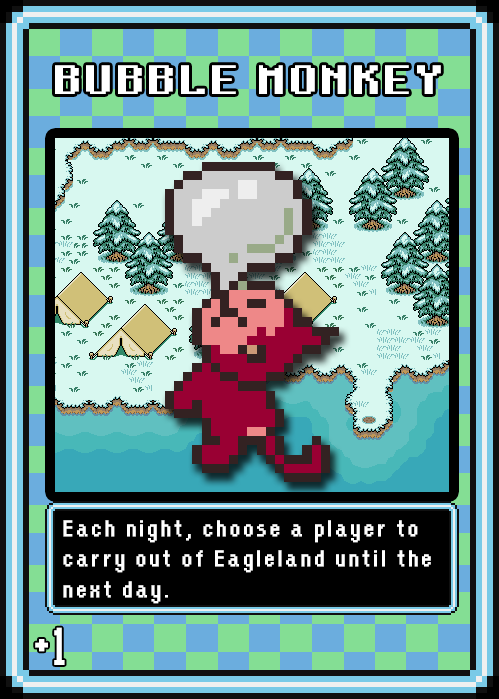 Come play the Earthbound version of the popular party Werewolf/Mafia – a game of bluffing and deception! 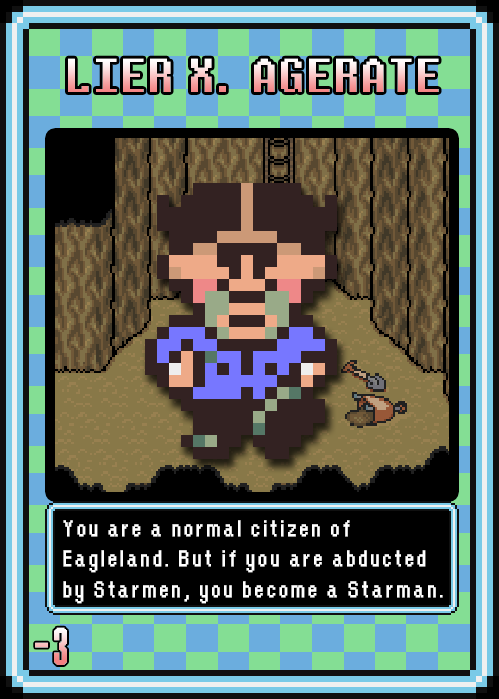 Extraterrestrial Starmen from the future have invaded the country of Eagleland and disguised themselves as Unassuming Local Guys. 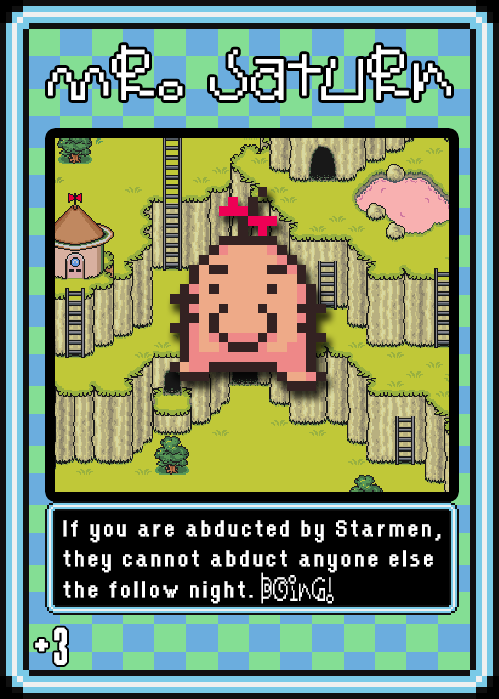 Each night they abduct another citizen until no one is left to stop their invasion! 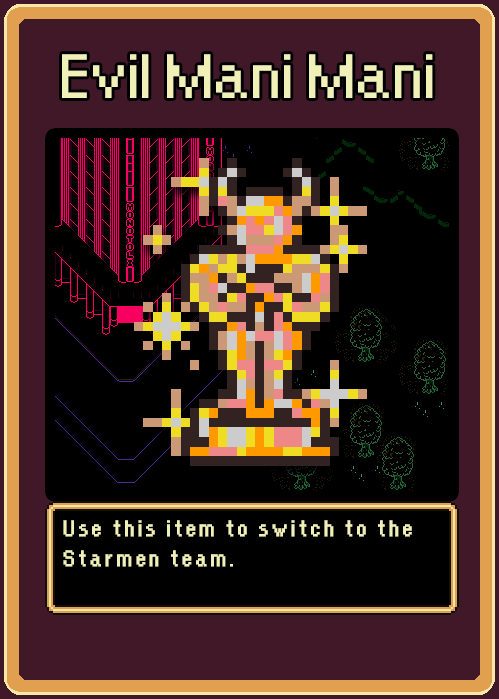 The only way to stop them is to vote to launch the suspected Starmen back into space! 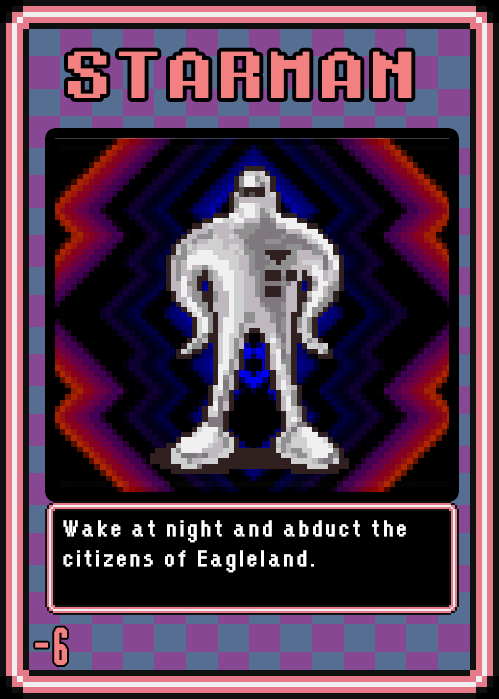 Will the citizens of Eagleland come together and oust this extraterrestrial threat? 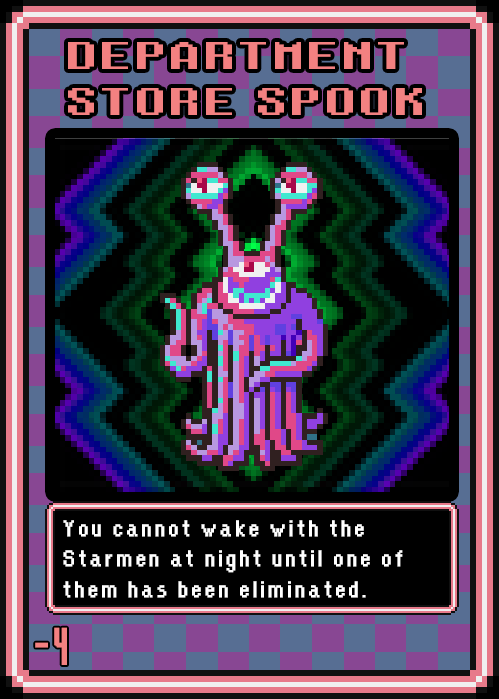 Or will the Starmen create a future draped in infinite darkness? 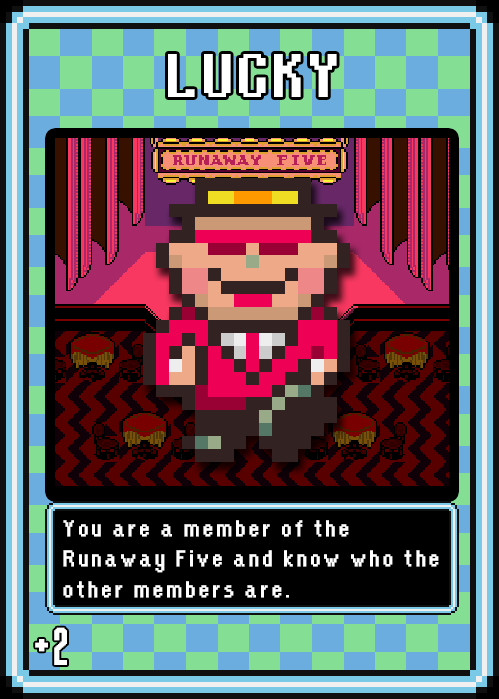 The game will include extra twists and turns with special roles including Ness, Jeff, Paula, Poo, Buzz Buzz, Mr. Saturn, Department Store Spook, The Runaway Five, and New Age Retro Hippie. 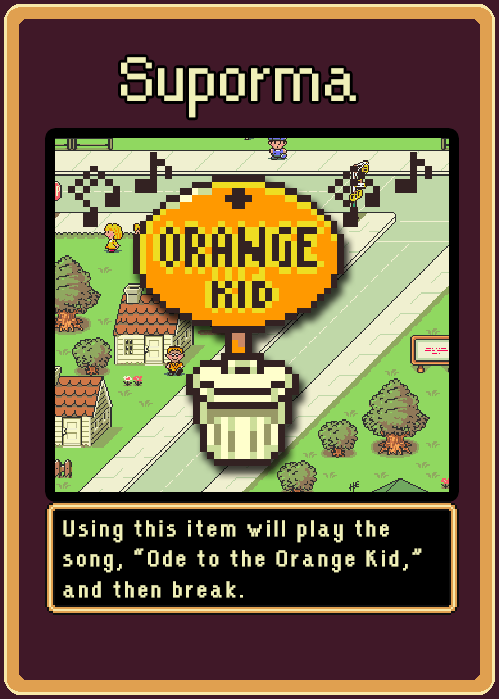 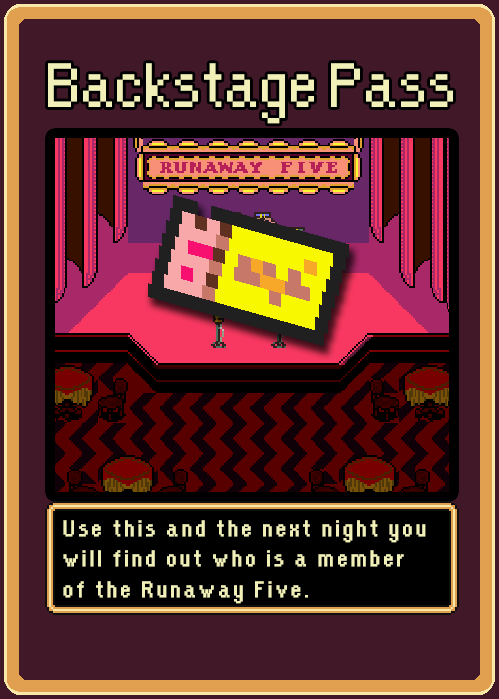 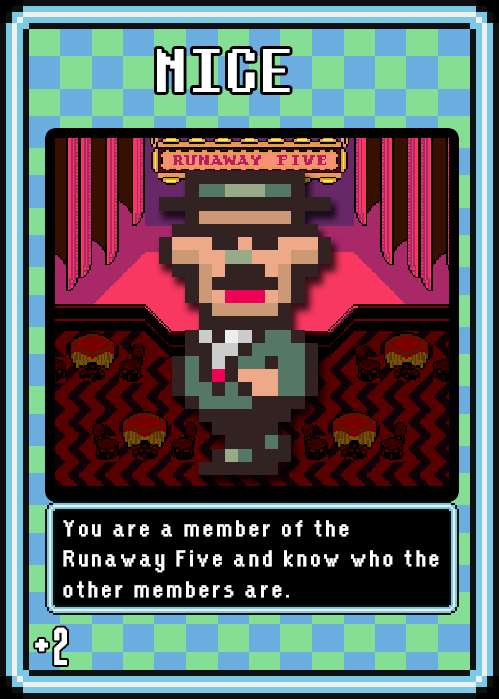 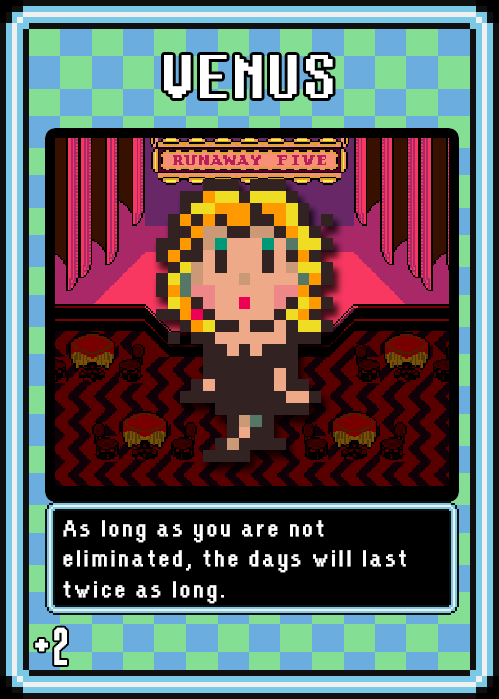 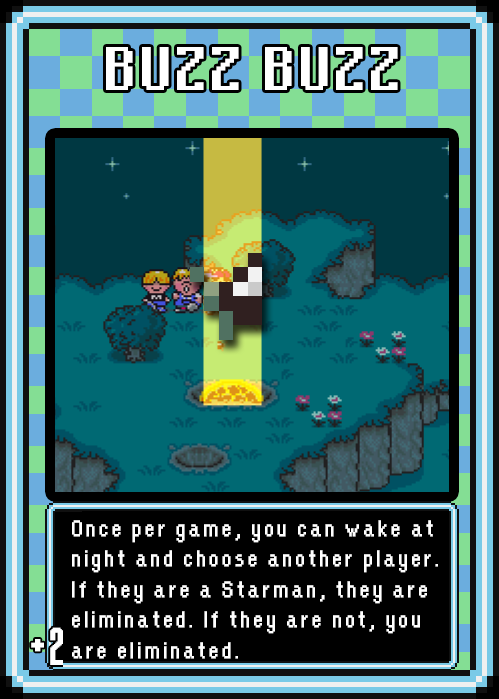 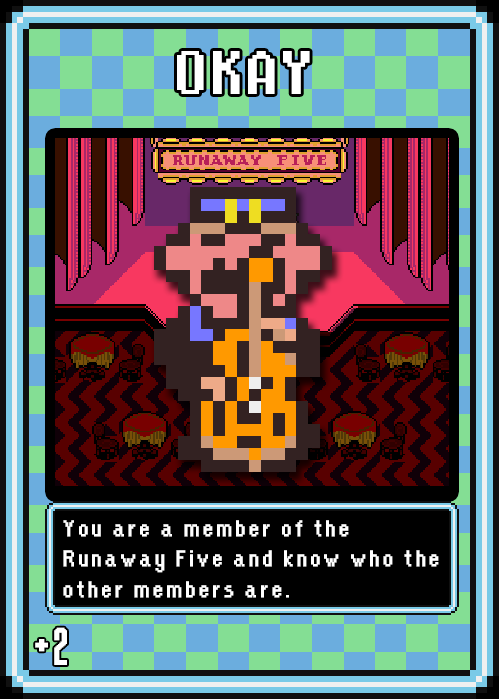 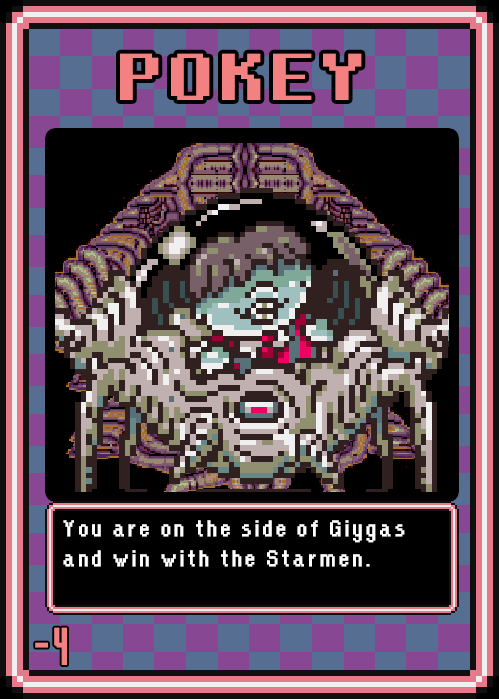 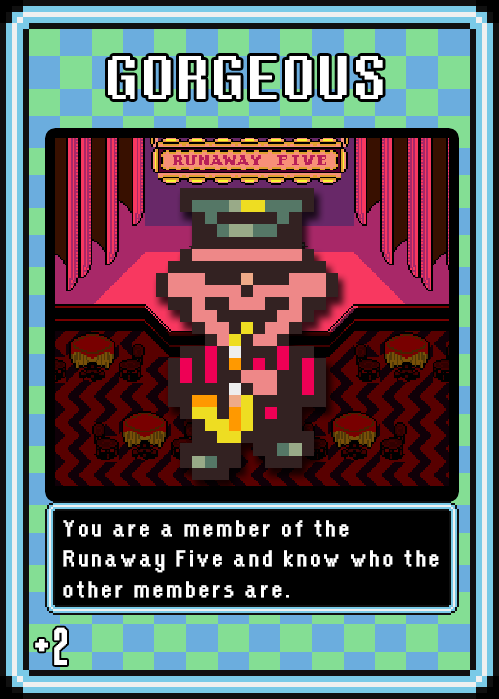 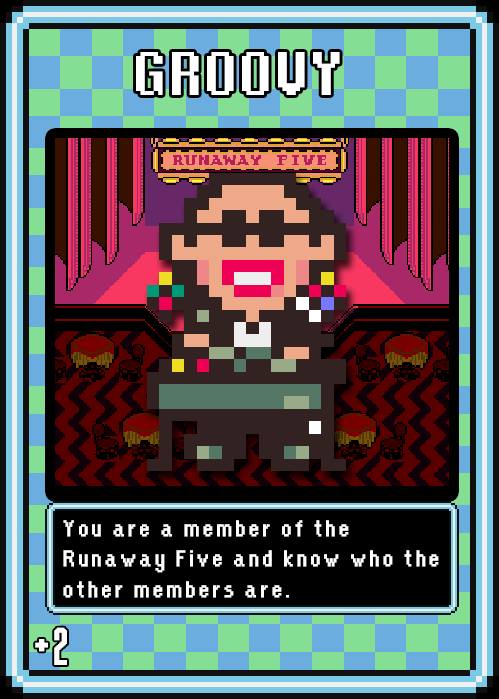 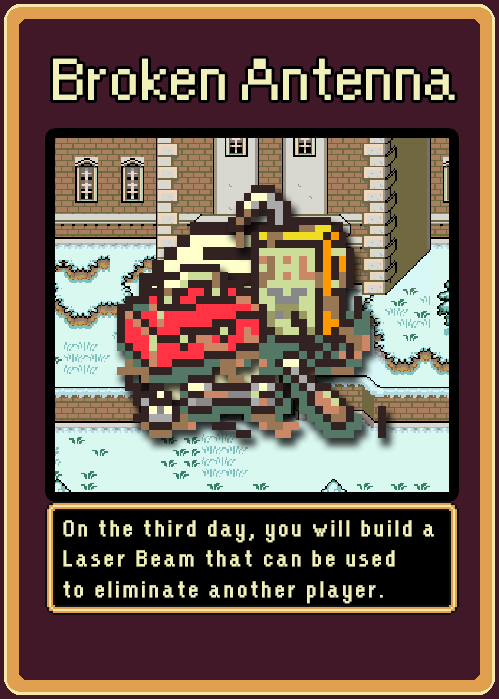 The “Are You a Starman” can accommodate 30 players at a time and features custom cards and music from Earthbound. 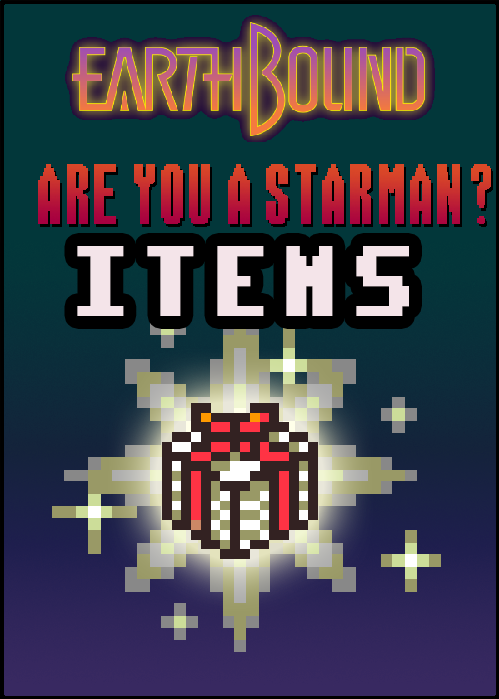 Absolutely no experience is necessary! 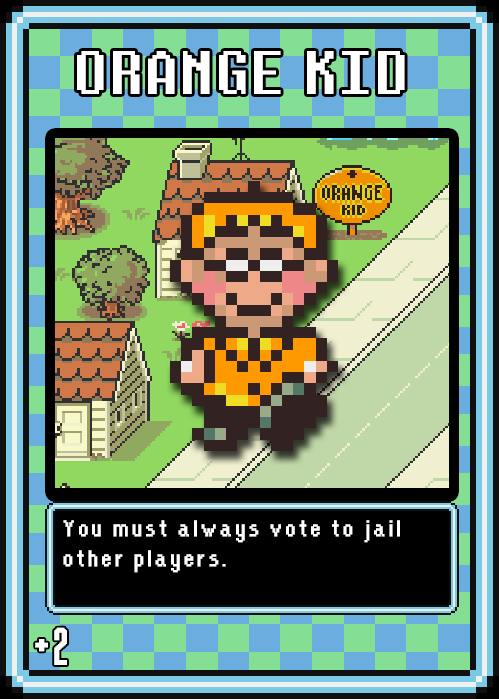 Assemble a town of Onett of 8-30 people. 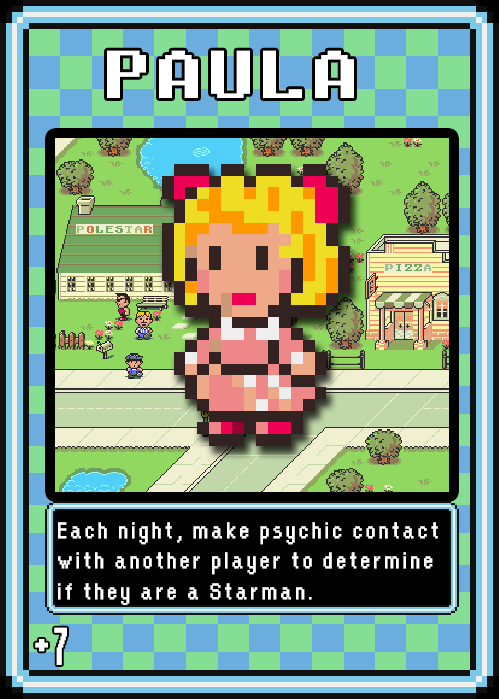 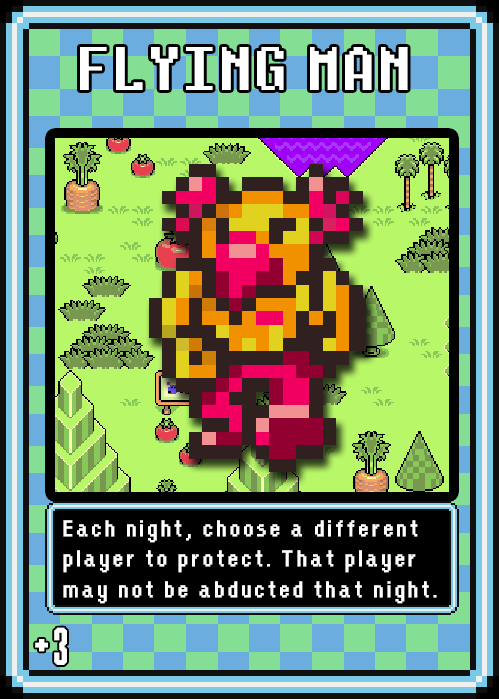 Most players will be “Unassuming Local Guys”, but two will secretly be “Starmen.” A third player will also be a mystic, Paula, who learns secrets during the night. 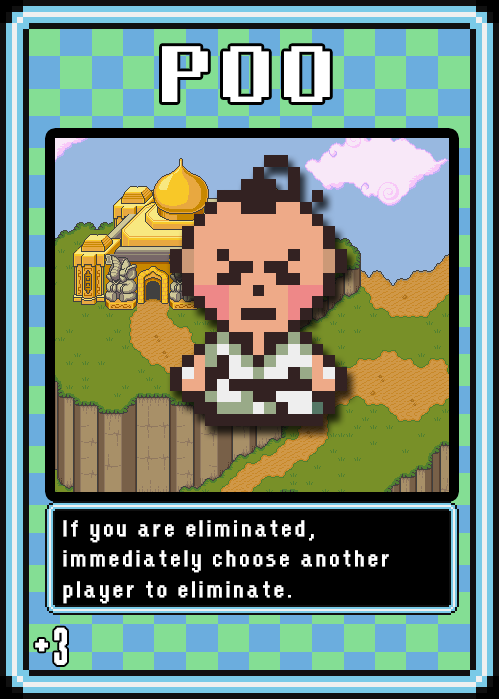 Lastly, a moderator is needed. 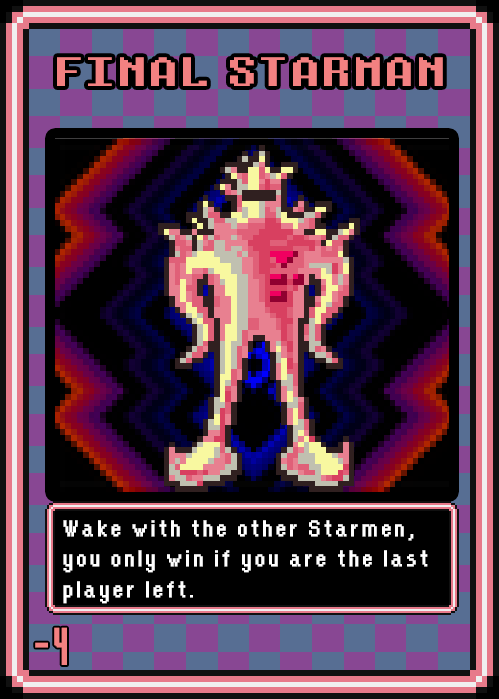 Deal a card to each player, face down. 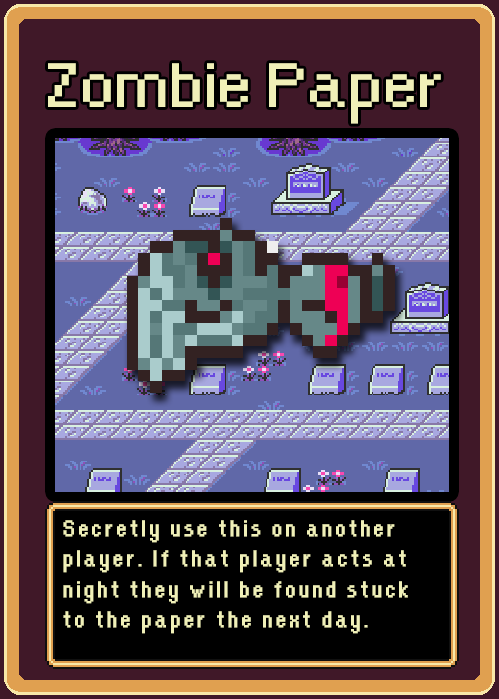 Everyone secretly looks at their card, and may not reveal it until they are killed. 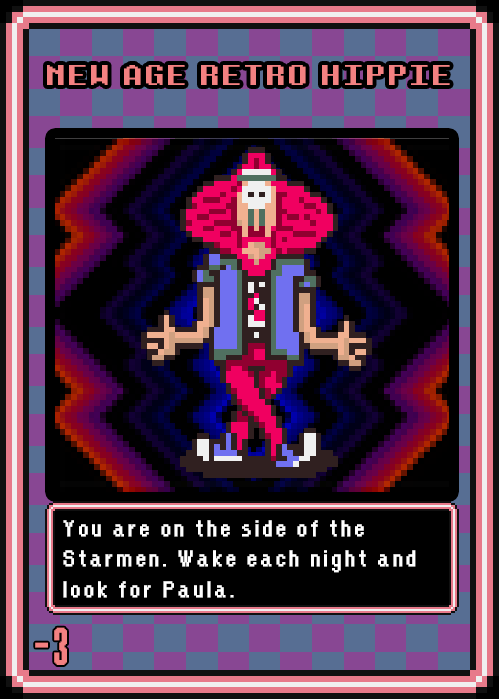 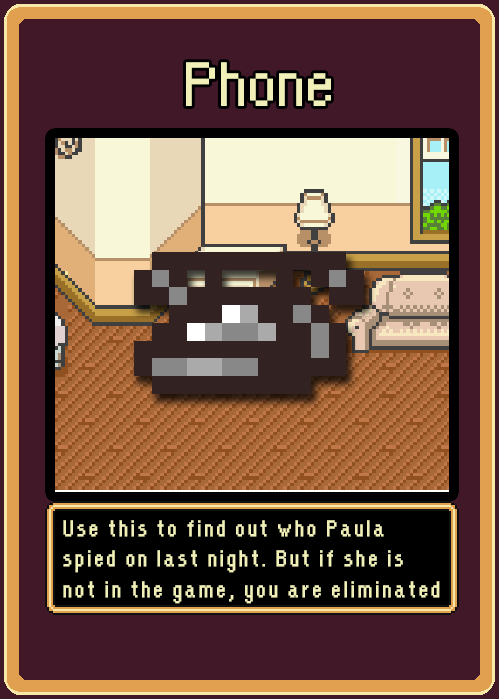 During the night, the Starmen will abduct someone, and Paula will learn the truth about one player. 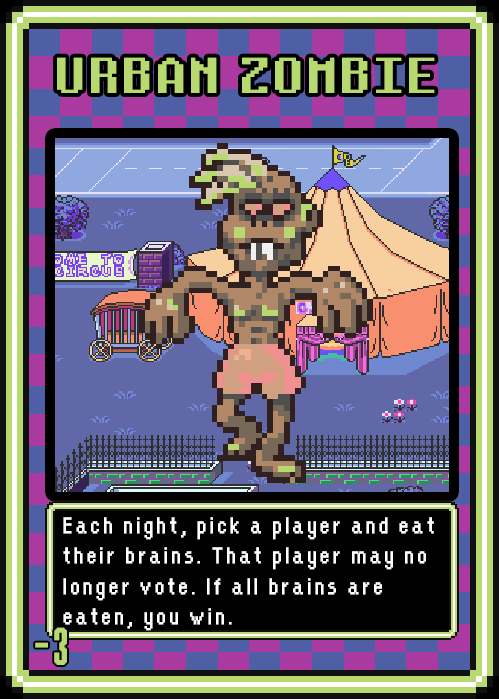 The moderator must lead the citizens through the events of the night by following the Moderator’s Script. 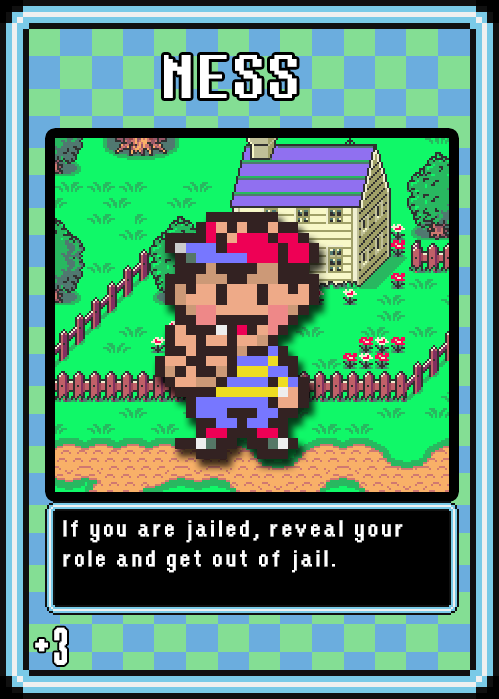 Players gather in Onett and discuss who to send to jail. 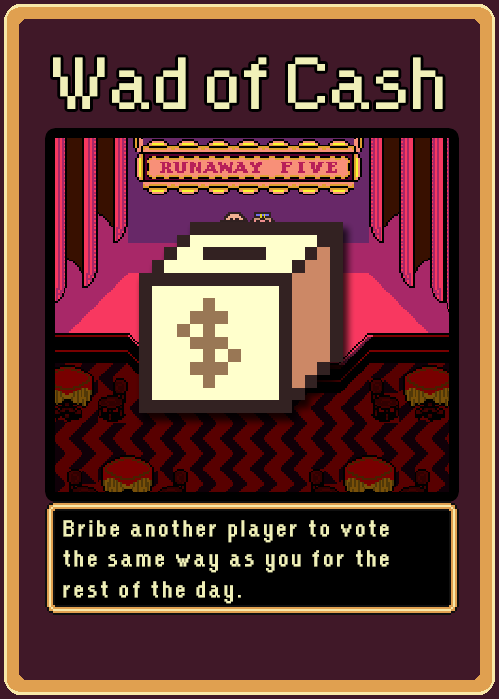 Once a majority agrees to send someone to jail, that player shows his or her card and says nothing for the rest of the game. 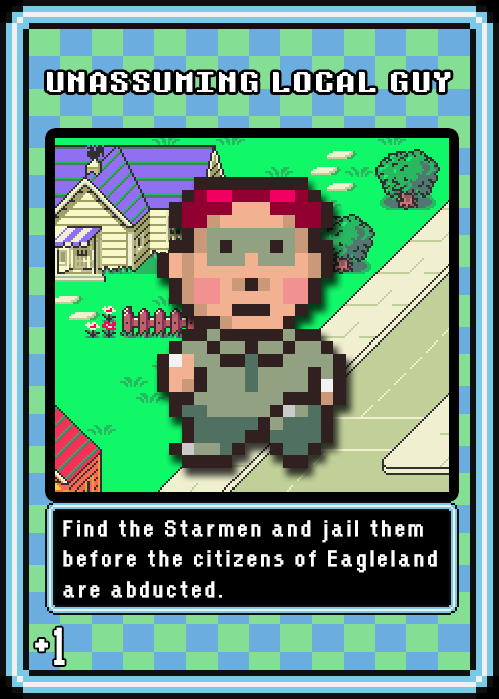 Repeat night and day until the Starmen are in jail or the number of Starmen and citizens is equal, in which case the Starmen overrun Onett. 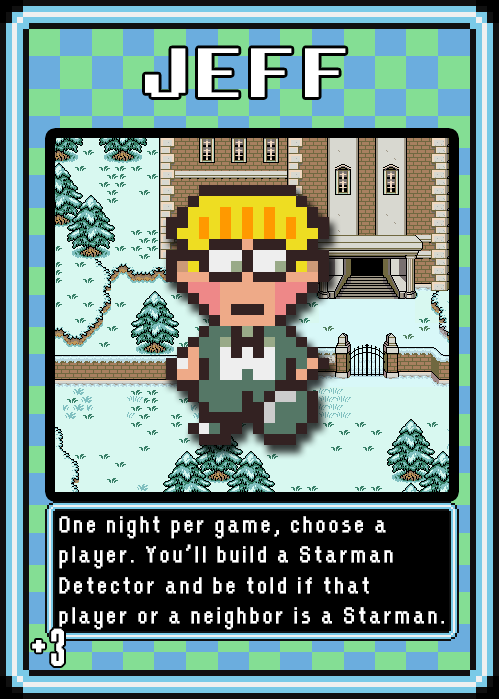 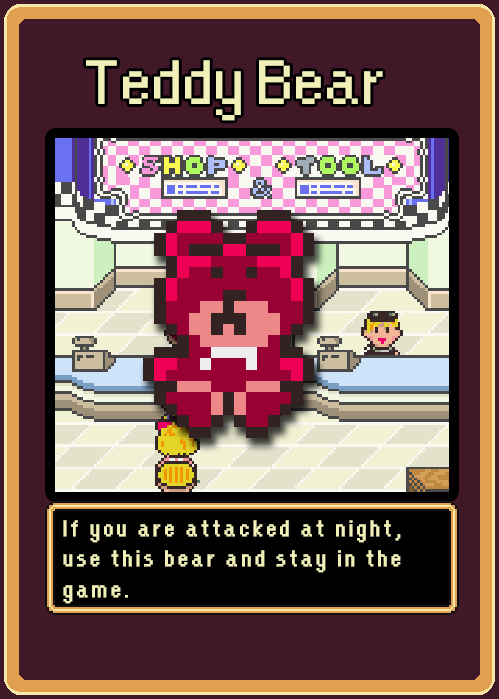 Along with “Starman,” “Unassuming Local Guy” and “Paula” expect there to be other special role cards that give additional abilities to the benefit of either team. 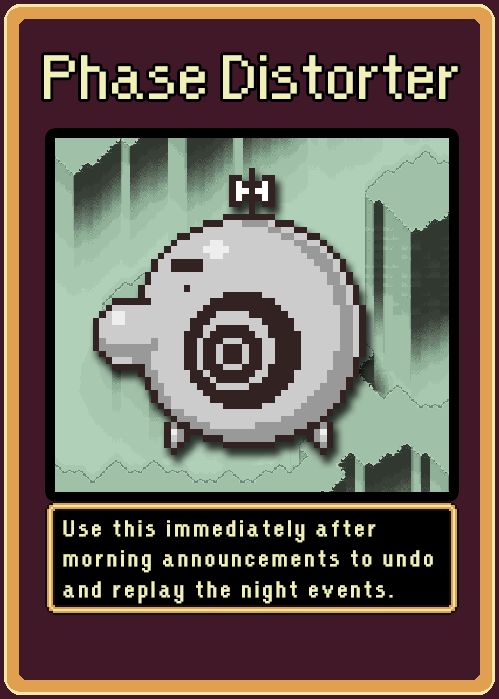 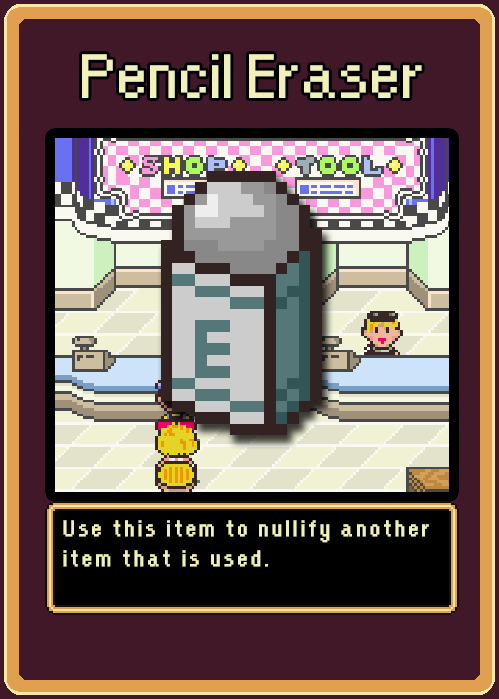 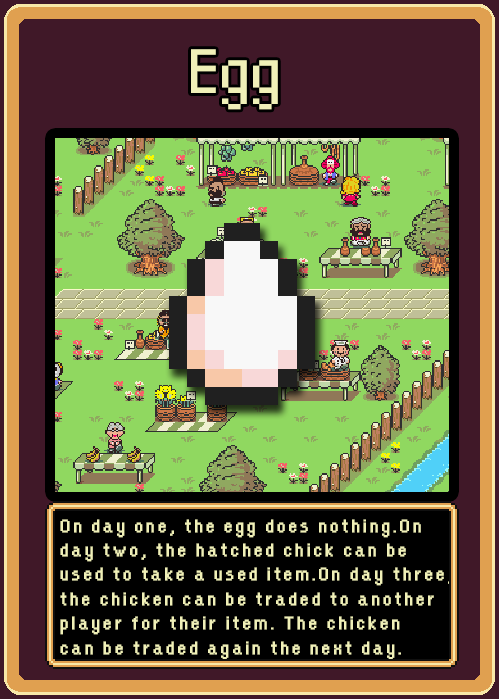 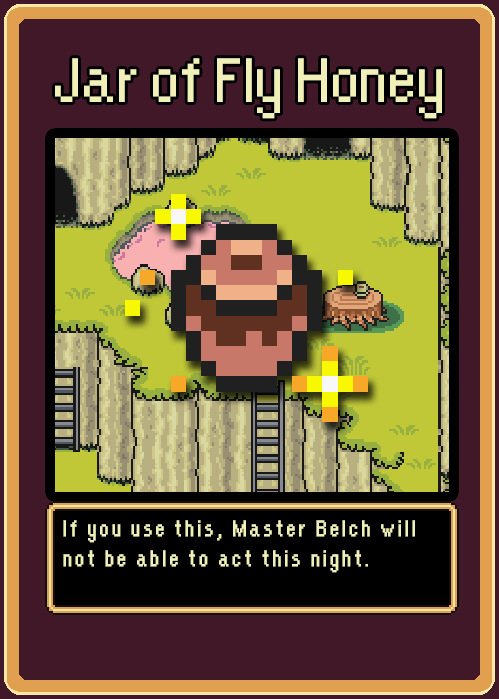 Items are one-time use effects that can only be used during the day and not during trial. 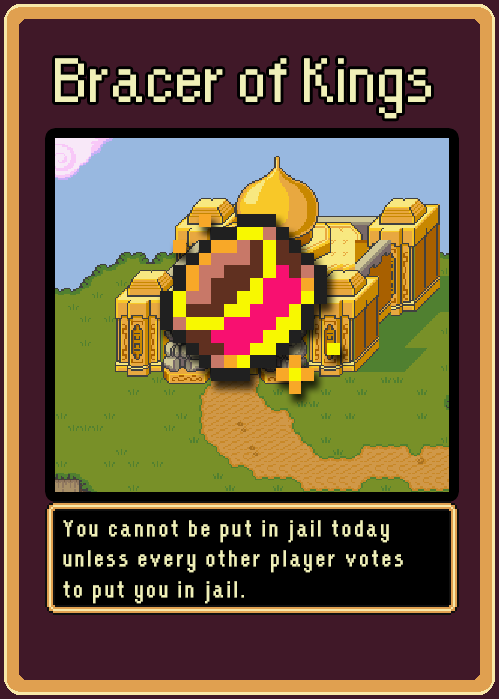 You cannot show your item cards, but when you use it, everyone will know what card you are using.